If you have thought about selling your business in the future, then you need to keep reading. Knowing that most entrepreneurs only sell one business, it’s difficult to know what you don’t know and it’s easy to make mistakes. And you don’t want to make mistakes when you sell your business, do you? The business is probably your biggest asset. You may be years away from selling or planning to retire. Either way, here are three BIG pieces of advice that will add value to your business and put thousands of dollars in your pocket when you do sell. Plan now. Do NOT wait. This is absolutely the best piece of advice I can give to help you successfully sell your business. A successful transition plan takes three to five years to implement yet it’s never too early to start. Set a time goal for when you want to sell and then get a market-based valuation of your business. “Market-based” means you will want to work with a professional business appraiser or business broker. If there’s a gap between your target sale-price and your business’ current value, develop and implement a plan to close it. That’s where the “three to five years to implement” comes into play. Very few businesses are ready for sale without preparation and it takes time to execute the changes that will lead to an increase of the business’ value. Next, it’s important to Think-Like-a-Buyer. Work to understand what drives value in the eyes of a buyer. Buyers, whether they be individuals, private equity groups or companies, are concerned with risk. Your business will most likely be acquired for its earnings so anything you can do to strengthen present and future cashflow will add value. Activities that strengthen cashflow include building a management team, creating systems and procedures, adding streams of recurring revenue and separating your identity from the company’s brand. A buyer needs to feel confident that the company can be successful without you. In case you don’t know, buyers and banks that finance business acquisitions like to see revenue and earnings that are increasing year-over-year. And financials that are accurately tied to tax returns increase buyer confidence. I love the book Built to Sell: Creating a Business That Can Thrive Without You by John Warrillow and Bo Burlingham. Warrillow thinks the number one mistake entrepreneurs make is they build a business that relies too heavily on them to be successful. Built to Sell tells the story of Alex, a struggling entrepreneur, who turns his company from one on the brink of closing to a successful saleable company. Alex doesn’t turn his company around on his own; he has a mentor, which brings me to my third tip for you as you prepare your business for sale. Don’t go it alone. Entrepreneurs are frequently so achievement-oriented and self-reliant that they fail to recognize when they should work with a professional. An entrepreneur’s business is usually their biggest asset so selling it without the assistance of a business broker or investment banker can lead to expensive mistakes. It’s smarter to work with a professional from the beginning than to discover when it’s too late to change course that you should have had help. Professional help. Talk to a few friends, or seek online reviews, for the names of trustworthy business brokers and investment bankers. Reach out and start a relationship. Trust me, they’ll like this, too, as they’d rather sell a business that has been well-prepared than one that has not. It’s easier and more lucrative for everyone. My final piece of advice: Waiting will not make it easier. Even if you love running and building your business and can’t wait to get to work each day, none of us will live forever. Everyone must leave their business at some point and we can either choose how and when we exit, or we can have it decided for us. It’s better to plan for success. Valerie L. Vaughn is a certified business intermediary and certified mergers and acquisitions professional with Apex Business Advisors, an Overland Park, Kansas, firm that assists with business sales, mergers and acquisitions. 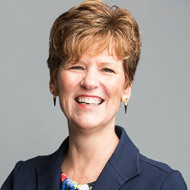 She is a member of NAWBO-Kansas City and currently serves as immediate past president.